I do a lot of research online; sometimes it leads down the oddest of trails, and those are always the fun ones to follow – the road less travelled, and all that. I keep a storehouse of “odds and ends” information, the trivial bits and bobs that might come in handy as I create a new world for a story. 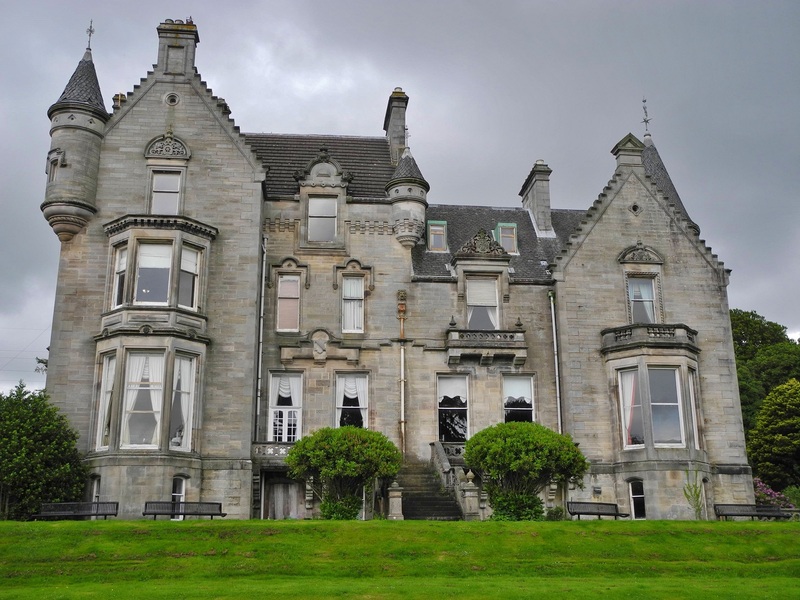 I was recently writing an article for one of my other blogs (click here to read it), and came across an interesting article on the topic of earthen flooring; such an element could be used in historical fiction, science fiction, or modern eco-escapism fiction. What I found fascinating is the way the writer describes her first experience of walking on such a floor: The leathery softness, the warmth, the texture, and the creative possibilities this type of flooring allows. Such things stir my creative juices, and I have to remind myself to finish my current manuscript before moving on! But such an element will come in very handy for my next book, which is a science fiction story… and now, because I’ve shared it with you, I’ll know where to find it when I need it! Click on the image below to read the article, and be inspired. Keep writing! This piece of writing has been floating around cyberspace for quite some time; I’ve tried to track down just who is responsible for it, with no luck. It’s so tongue-in-cheek, your tongue may permanently stay there, and I dare you not to think of the whole family tree the next time you hear any of the associated phrases! The lineage is finally revealed. Many people are at a loss for a response when someone says “You don’t know Jack Schitt.” Now you can intellectually handle the situation. Jack is the son of Awe Schitt and O. Schitt. Awe Schitt, the fertilizer magnate, married O. Schitt, the owner of Needeep N. Schitt Inc. They had one son, Jack. 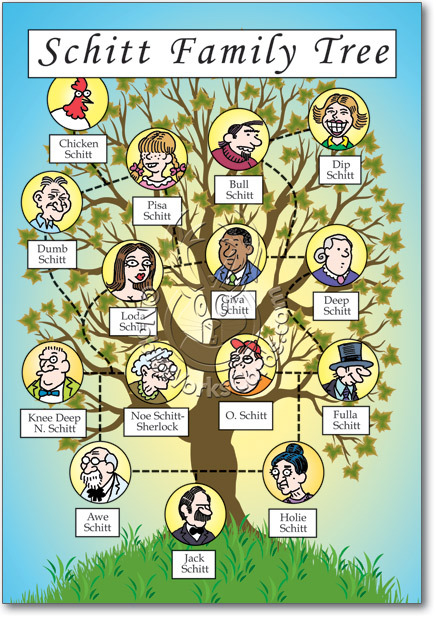 In turn Jack Schitt married Noe Schitt, the deeply religious couple produced six children: Holie Schitt, Fulla Schitt, Giva Schitt, Bull Schitt, and the twins: Deap Schitt and Dip Schitt. Against her parents’ objections, Deap Schitt married Dumb Schitt, a high school drop out. However, after being married 15 years, Jack and Noe Schitt divorced. Noe Schitt later remarried Ted Sherlock and, because her kids were living with them, she wanted to keep her previous name. She was then known as Noe Schitt-Sherlock. Meanwhile, Dip Schitt married Loda Schitt and they produced a son of nervous disposition, Chicken Schitt. Two other of the six children, Fulla Schitt and Giva Schitt, were inseparable throughout childhood and subsequently married the Happens brothers in a dual ceremony. The wedding announcement in the newspaper announced the Schitt-Happens wedding. The Schitt-Happens children were Dawg, Byrd, and Hoarse. Bull Schitt, the prodigal son, left home to tour the world. He recently returned from Italy with his new Italian bride, Pisa Schitt. She’d had a pet dog, a mastiff who was known in the region by his Chinese name, Ho Le Schitt, because he ate small gangsters for breakfast; she couldn’t afford to feed him in her new country, so she left him where his food supply would not run out. So now when someone says, “You don’t know Jack Schitt,” you can correct them. Writing fiction often brings the writer to a crossroads: Should I take my character(s) down this road or that? Will they decide this or that, and what will the consequences of either choice or decision be? Which would fit best into my plot? All of these questions can be answered by applying a corporate business tool called the SWOT analysis chart. I have this baby hung on a magnet strip near my desk, along with other prompts such as the sensory image, and I apply it frequently. Just last week I faced a crossroads: Would A) my character run away, or would B) another character (or C) take her away? 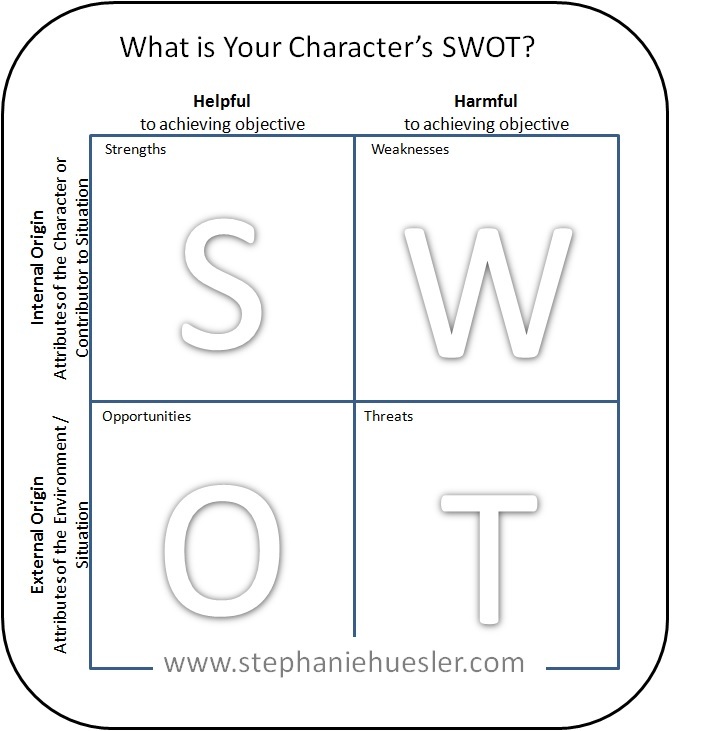 On the latter question, I had another two options (thus, B & C); I needed the SWOT. This image shows you the variables of each option; internal vs. external influences or attributes of a situation or choice; helpful vs. harmful in reaching the character’s goals, or the consequences of the choices laid before you. What are the Strengths, Weaknesses, Opportunities and Threats of each path at your character’s feet? I’ll give you the example of my thought process as I applied it to my historical novel’s fictional situation: If my character ran away (A) , the strength would be that she would be taking her destiny into her own hands – it’s what you want your main character to do; the threat would be that such an action might raise assumptions that would damage her reputation (was she pregnant?). The opportunity of doing things in her own timing was overshadowed by the weakness of practicalities: How would she, without support, get from her family’s estate to Portsmouth, at least a good half-day’s journey by carriage? If the “B” character (her mother) took her to Portsmouth, the main character would be passive in the decision – the action would happen to her rather than her controlling or causing it. The opportunity of solving the weakness of “A” by giving her a ride to Portsmouth was a strong incentive, but would raise a bigger threat in that it might seem like the mother was being just as manipulative as the father, forcing the main character into making a choice to suit the mother, which wasn’t the case. If “C”, her future husband, came to sweep her away from the problems at home, again it would seem that the main female character wasn’t strong on her own two feet, or was too pliable and passive. I took each scenario through the SWOT rigorously, and in the end I decided – well, when the book comes out next year, you can find out for yourself! Applying such tools helps you focus your energies on finding solutions, rather than finding yourself stuck in writer’s block. 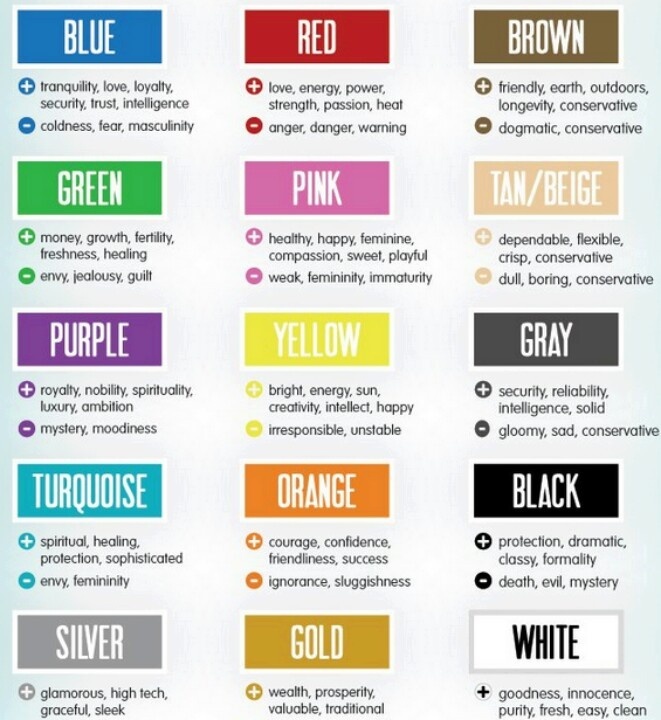 I was recently talking with someone, and the topic of the psychology of colours came up in connection with health care; it got me thinking about how it could be applied to practical applications, as well as writing fiction. My particular practical application is crocheting hats to donate to the local cancer patient clinics, and I wanted to know which colours would be more appropriate. In writing fiction, colours play an important part as well; they help set the scene: Is it a dark and gloomy scene? Don’t choose pink or pastels – unless you want to make it a creepy-gloomy scene. The colour of the sky, the grass, the sand, living room walls, a person’s eyes – they all help set the stage, or paint the backdrop of your fictional character’s life, situations, or the overall tone of the book; it can also help establish your character’s personality: Are they a compassionate, stable person? Perhaps beige combined with a bit of pink. Is your character blind, (figuratively or literally)? Red is the easiest colour for a visually impaired person to see, so accent their home in red. You get the idea! 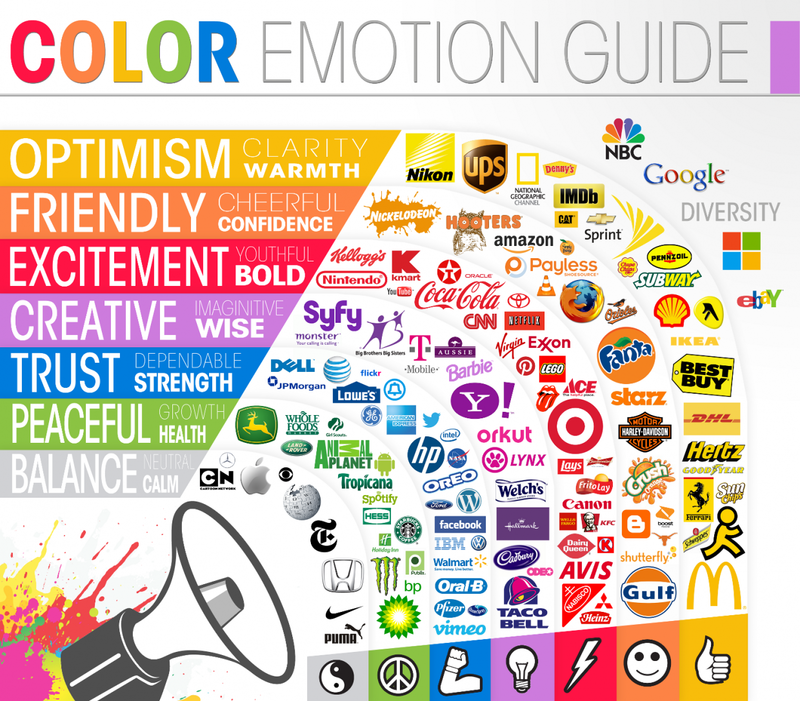 Advertisers have been using the psychology of colours to manipulate consumers for decades; the more we understand the application of colour, the more we can see through the tactic and at the same time apply it to our writing. Here are a few images to consider as you think into this topic and apply it to your own fictional characters. 1) Develop your characters well enough to make their voice distinct; do they have catch-phrases, or local dialects that influence their vocabulary? Do they tend toward long or short sentences, or are they from a past time and place that had a different way of speaking? Educate yourself if necessary in various modes of speech . b) What a character chooses not to say, but inadvertantly reveals through actions. c) Why the character says what they do. Do they have particular actions when they are upset or aggitated that communicate their moods to the reader? Do they bounce their knees when excited? Does their body language confirm or contradict their verbal message? 3) Fictional dialogue needs to cut to the chase; if there’s no point to the text (revealing motivation, character or plot point), then chop it! 4) Avoid the trap of using dialogue as exposition (the proverbial villain’s monologue as he prepares to destroy the hero), but rather reveal essential information through action, or narration. Explore your characters and develop their voices, and above all – keep writing! I try to read a book a week; it’s usually on a Saturday, when I have time to sit down and read a good chunk at a time. This past weekend I read a book which prompted thoughts around this concept of “sensing” a scene, and reading it aloud to hear any howlers that might have crept into the writing. The author of that book obviously did neither, though her editor might have told her to beef up descriptives – so they were clumped all together, staggering me as a reader to a halt while I tried to figure out the context of the pages of descriptives before remembering what the characters were doing there in the first place, and often the dialogue sounded very stilted (e.g. using “vocalized” instead of “shouted” – the latter of the two would have fit into the character’s time and place far better) – a good reading-aloud editing session might have done wonders for the novel. 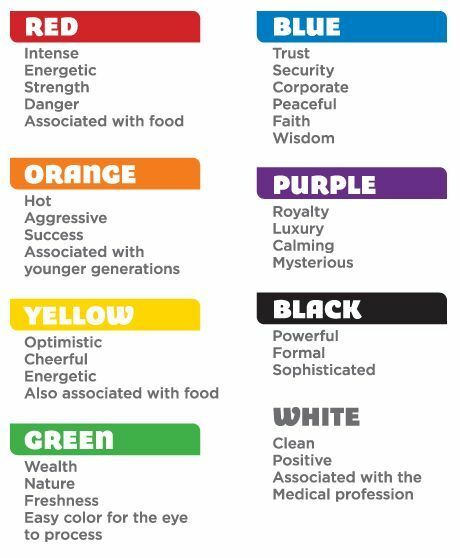 While adjectives are useful for adding colour or depth to a sentence, think of them as pepper; too much can spoil the scene. If using more than one to describe a noun, familiarize yourself with the rule of order for adjectives. 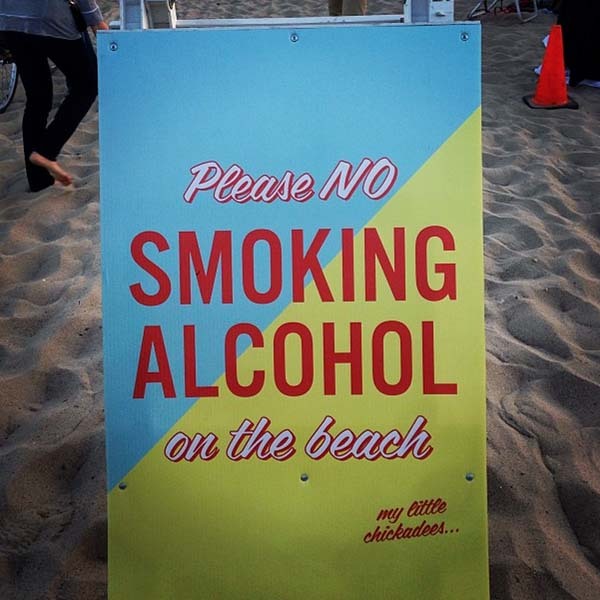 Use action verbs rather than passive/being verbs with adverbs. E.g. “She stumbled down the hill” rather than “She went unsteadily down the hill”. 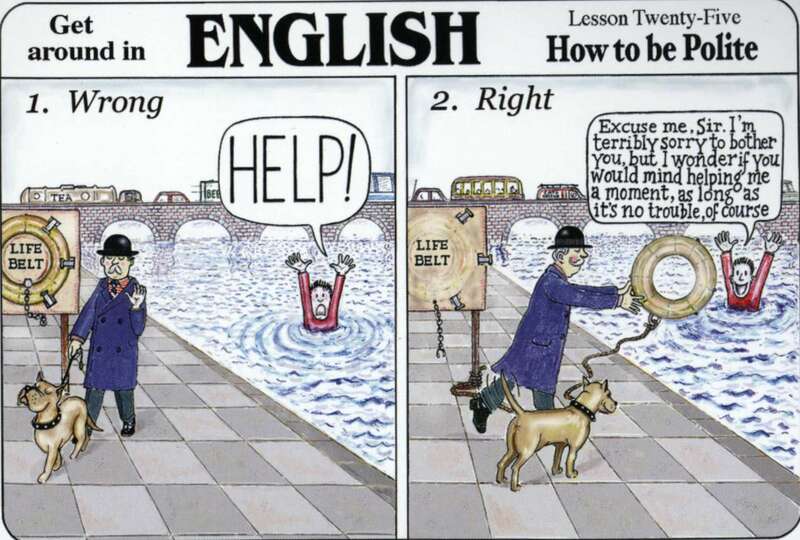 Most importantly: Read your sentences and scenes aloud! I cannot stress this enough – if it sounds choppy or stilted to your ears, or doesn’t sound like something your character would say or do, then change it! 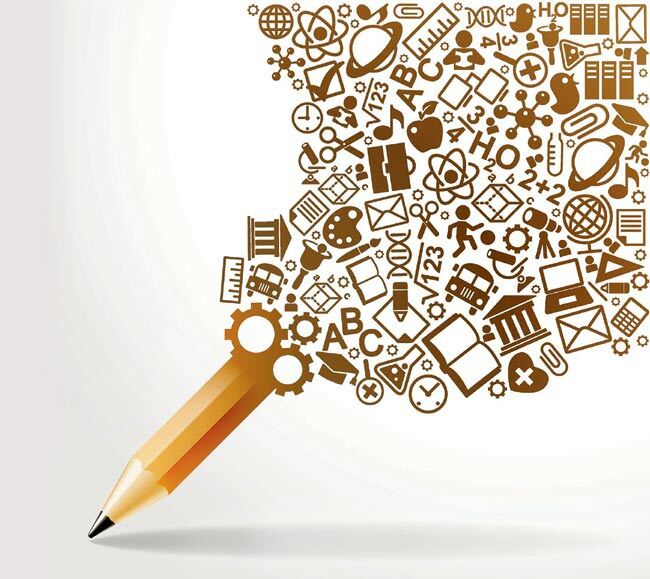 Writing is a dynamic process, and being a writer means constantly striving to improve oneself – building vocabulary and learning how to use words effectively, building your knowledge through research, studying, and reading, reading, reading! Keep on writing! Once in a while, we need to get our creative juices flowing; here are some ideas to spark your imagination! Pick one, get a pen and paper, and start writing! See where it leads! 1. What is it that you are absolutely sure you will never forget? 7. Describe each day of the week as if it was a person. 11. which friend will become the most famous?